Each of the nine lessons of Financial Peace University have some homework component that we ask you to complete, in addition to watching the lesson video either at home or at a host location with other members. Homework for each lesson is listed next to the video player of each individual lesson (and in your workbook). From the main page select Learn in the left navigation. Our FPU site remembers your progress and should display your current lesson at the top of the lessons page. 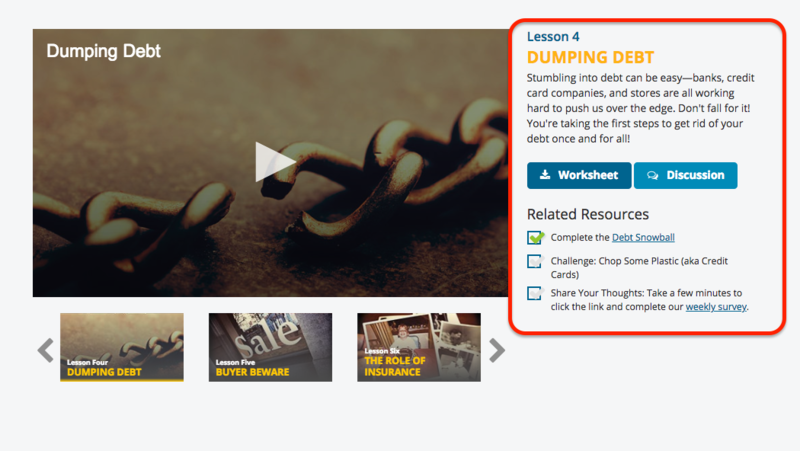 You can also scroll through the lessons under the video player and select the specific lesson you need. On the specific lesson page, look to the right of the video player and you will see the "Related Resources" section. Each lesson will include something different. You might be instructed to work on your budget, or make a list of your insurance deductibles, or pray about your giving habits.